Thin encrusting to large arborescent, cylindrical digitate branches, few bifurcations, attached to substrate with basal holdfast. Color red-brown (most common), brownish purple, or dirty yellow (encrusting form). Soft, spongy, elastic. Surface smooth to uneven with with tangential spicule skeleton. Microscleres: sigmas (2 sizes, 25 and 80 mm), toxas, raphides, palmate anisochelae (2 sizes, 20 and 45 mm), and palmate isochelae (10 mm). 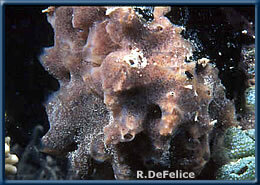 In the Hawaiian Islands, this sponge is mainly restricted to shallow-water fouling communities (i.e. pier pilings, floating docks) of the major harbors on Oahu or associated disturbed habitats (i.e. dredged channels and artificial lagoons). In Kaneohe Bay, is found on patch reefs in southeast corner of the bay as well as the fouling community on Coconut Island floating docks. Oahu - Pearl Harbor, Honolulu Harbor, Keehi Lagoon, Barber's Point, and Kaneohe Bay. Caribbean, Brazil, eastern Pacific at Panama, main Hawaiian Islands, Indo-Malay Region, Australia, Indian Ocean. Unintentional introduction, most likely as fouling on ships' hull. Fouling organism. Ecological impact unstudied, but observations suggests competition for space with native species. Sponges are filter feeders, continuously circulating water through their bodies. Microscopic food particles are removed from water by specialized collar cells. Digestion is intracellular. De Laubenfels (1950) recorded this species first from Kaneohe Bay in 1947, and further noted that it was abundant on the hulls of vessels that remained for a year or more in Pearl Harbor. He considered it to be a native species providing a biogeographical link to East Indian fauna. At the time, M. parishii was previously known from the Indian Ocean, Indonesia, and Australia. It has since been reported in New Caledonia, Jamaica and Brazil (Hechtel 1965). Bergquist (1967) again recorded it from the floating docks on Coconut Island, Oahu and considered it to be introduced. This species is considered to be an unintentionally introduced species to Hawaii due to its widespread distribution and affinity for the fouling community and associated disturbed habitats. Bergquist, P. R. 1967. Additions to the sponge fauna of the Hawaiian Islands. Micronesica. 3: 159-174.
de Laubenfels, M. W. 1950. The sponges of Kaneohe Bay, Oahu. Pac. Sci. 4(1): 3-36. Hechtel, G.J. 1965. A systematic study of the Demospongiae of Port Royal, Jamaica. Peabody Mus. Nat. Hist. Yale. Bull. 20.